Kunnathur Padi, the Aroodam of Sri Muthappan in located near Srikandapuram in Payyavur Village of Taliparamba taluk in Kannur District. Kunnathurpadi festival which starts in Malayalam month of Dhanu 2nd and ends in Makaram 2nd is conducted in a natural settings because Sree Muthappan said that "fallen leaves, a spring, a large mountain, a round stone, forest and palm trees are enough for me." There are no temples for Muthappan in Kunnathur padi . This area is beautiful with its greenery and is 3000 feet above sea level atop Udumbamala of Sahyadri Mountains. The divinity and the purity of this place is been maintained for centuries, with its breath taking beauty. Any visitor, coming to this area will feel the blessing hand of Sri muthappan and will be able to cross the thin line that separates the spiritual existence and the miseries of the material world. There is an open place and a cave in the middle of the forest. During the festival season, a temporary madappura is erected here, which is called Sreekovil. On the west side of this madappura, there is a stone, a rock stand and a mud platform. On each side of the cave there is a palm tree. On the north side, there is a spring called Thiruvankadavu. Beyond that is Aadipadi. Thanthries do the purifying rituals (Sudhi, Pasudanam, Punyaham, Ganapati homam and Bhagavathiseva). 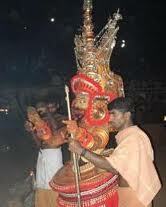 The Malayirakkal (invoking) of Sri Muthappan is done by Puralimala. In all other madappuras, this is done by Kunnathurpadi. At Kunnathurpadi, invoking of Sri Muthappan (malayirakkal) is from Puralimala whereas at Puralimala, it is from Kunnathurpadi. In all other madappuras, this is done from Kunnathurpadi. On the first day of the festival, four theyyams appear at Padi Puthiya Sri Muthappan, Puramkala Sri Muthappan, Naduvazhissan Daivam and Thiruavappana. The concept of Vannan about Sri Muthappan is that of Eiver Muthappan (five Muthappans) - Puramkala Sri Muthappan, Puralimala Sri Muthappan (Thiruvappana), Nambala Sri Muthappan (Nambala is ant hill) Sri Muthappan (Vellattam), Thoovakkally Sri Muthappan and Andu Muthappan. There are very interesting scenes in the rituals of Padi. Muthppan does Pallivetta and accepts veethu (madhu) One of the acts depicts the Lord’s writing on the granite stone with His arrow. He is writing moola mantras.Perhaps, with this act, the Lord may be writing the customs ad traditions the generations should observe for all times! One special thing at Padi is that Thiruvappana and Vellattam do not appear simultaneously as in many other Sri Muthappan centres. He comes in the night and goes in the night . After the divine dance is over, He sits on the platform and asks Nayanar also to sit in front. Sri Muthappan recites the pattola. It is the history of the Lord and His relationship with the Vanavar. Bhandaram (coffer) is brought. Devotees do not put anything directly to the coffer. Offerings are given to the Lord in hand, and Bhagvan places it in the coffer. Then begins the most important aspect of the festival. Sri Muthappan starts His arulapadu. The long wait of the devetees is over and He hears their grievances, consoles them and blesses them. Vellattam appears after that.